Ruka, Finland – On Friday, Vermont’s Andy Newell skied his best World Cup since 2013, finishing fourth in a classic sprint in tough conditions. 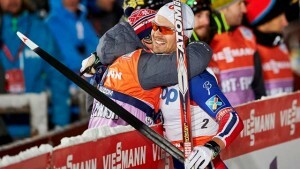 Norway swept the podium in the men’s competition: Sondre Turvoll Fossli dominated the final heat to win his first World Cup race, ahead of Eirik Brandsdal and Petter Northug. In the woman’s competition, Maiken Caspersen Falla of Norway won the overall race followed by Stina Nilsson of Sweden and Ragnhild Haga of Norway. Ida Sargent (Orleans, Vt.) and Sadie Bjornsen (Winthrop, Wash.) progressed through each round but did not move onto the finals. The second race of the Ruka Triple, a 10k/5k Freestyle, takes place today. 3 NOR NORTHUG Petter Jr.